Boston’s Spring Lane is transformed into Wellspring Fords, a communal watering hole that encompasses the days of Shamut peninsula before the Pilgrims to the present day. Communities form around these waters sources and bring all different walks of life together. With our interactive projection, WellSpring Fords, we hope to engage the present day passers-by and inspire them to pause and interact with the installation and each other. Wellspring Fords will be awash with static blue and green overlapping lights, filling the entire length of the alley with the light of the stream. 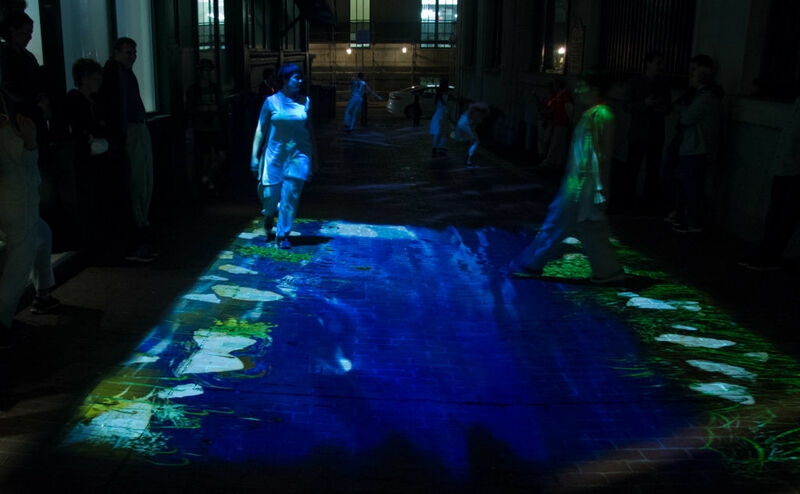 The interactive component allows participants to walk through the projected riverbed and reveal hidden features. Waves swell and shrink, revealing tidbits of a long history of a city stream excavated one participant at a time. Shown at Illuminus 2017 in Boston’s Downtown. Wellspring Fords uses digital projection, OpenFrameworks and the XBox Kinect depth sensor creating a custom interactive river. This project was funded by the Downtown Boston Business Improvement District (BID). Wellspring Fords Festival Footage. Illuminus 2017.